Lough Carra, a mostly shallow, hard water lake with a surface area of around 4,000 acres, is located as part of the Great Western Lakes system about 15 km south of Castlebar and 5 km north of Ballinrobe. The maximum depth of water is around 19 metres, but the majority of the lake is shallow with an average depth of around 1.75 metres. The catchment, which is fairly flat terrain with low-lying drumlins, is relatively small at around 114 km² and has an underlying geology of Carboniferous limestone. The shoreline, with a total length of about 69 km, is extremely convoluted, with many small bays, inlets and peninsulas. There are over 70 islands scattered throughout the lake, varying in size from less than 50 m² up to just over 1 ha (2.5 acres). The vegetation of the land around the lake is very varied, with mature deciduous woodland, conifer plantation, mixed woodland, scrub, grassland, marsh, fen, peat bog and heath, with cattle and sheep grazing being the predominant land use in the catchment now (although historically much of the farmland was arable). The water is alkaline and was naturally oligotrophic, i.e. nutrient-poor. It is now mesotrophic with a higher level of nutrients principally as a result of intensification of agriculture in the catchment. The lakebed consists of marl (calcareous deposits) and this gives the lake its characteristic, pale turquoise, translucent appearance, although in recent years the increasing pollution has resulted in the colour becoming much greener from the algal growth. The aquatic plants are dominated in much of the lake by charophytes (stoneworts), and there are extensive reed beds (Phragmites australis) and stands of true bulrush (Scirpus lacustris). 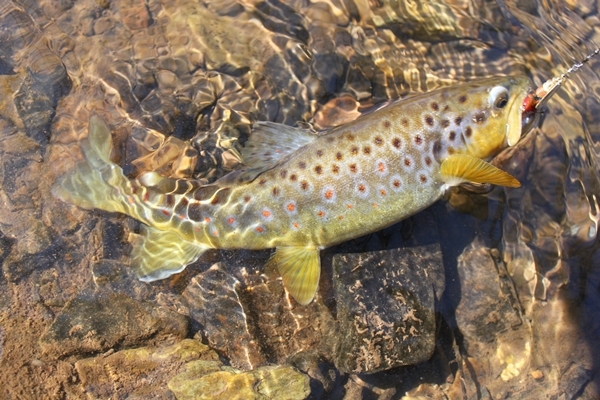 Prior to the pollution of recent years, the lake was noted for its extremely abundant population of mayflies (Ephemera danica) – now very scarce, and the aquatic invertebrate fauna is now dominated by chironomids. 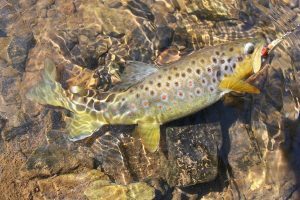 The fish population includes native brown trout (Salmo trutta) and introduced pike (Esox lucius) and perch (Perca fluviatilis). The reed beds are of great importance to bird populations and provide roost sites for up to 15,000 swallows and 60,000 starlings. The lake was also famous for its waterfowl populations, especially that of the Mallard (Anas platyrhynchos), but catastrophic declines have occurred over the last two decades with the changing ecology of the lake and its surroundings. The conservation value of the lake includes continued presence of otters (Lutra lutra) and White-clawed crayfish (Austropotamobius pallipes) and the lakeshore habitats include Cladium fen, alkaline fen, limestone pavement and orchid-rich grassland. Indeed, the lakeshore has at least 18 species of orchid and holds what is probably the best wild orchid site in the country. Sport angling for trout and pike have been major recreational uses of the lake, and there is some canoeing, leisure boating and swimming. In recent years, poor angling returns have reduced the number of visiting anglers, and this has had a negative impact on the local services such as B&Bs and boat hire. Because public access to the lake is restricted to a few points, it is less used for other recreational purposes and is, consequently, undervalued. The main threat to the lake’s ecology is ongoing eutrophication deriving from the intensification of agriculture in the catchment. Since 1970, over 25% of the land in the catchment has been converted from semi-natural habitats to improved grassland, with concomitant increased application of chemical fertilisers and slurry. Other threats include destruction and degradation of lakeshore habitats and the potential introduction of invasive alien species, including zebra mussel and the pondweed Lagarosiphon. Design and implementation of a comprehensive management plan. Stricter regulations for use of chemical fertilisers and slurry and additional incentives to encourage reduction of agricultural intensity. A mechanism to prevent or mitigate against the ongoing problem of land conversion. Prevention of damage to habitats, including development of management agreements with landowners/farmers. Prohibition of boat movements onto Carra from water bodies infested with zebra mussel or Lagarosiphon.